Most likely, the name of this place refers directly to the appearance of the rock marking the western end of the bay, over which Lentas is located. This rocky peninsula resembles a sitting lion with its shape. The name Λέντας comes from the Greek word λέοντας, whose Polish equivalent is the word "lion". It is easy to see that this inconspicuous town can boast a very long history. Driving into it, one can not overlook the remains of the Asklepios temple from Roman times. Archaeological excavations in Lentas prove that its history goes much further. Few traces of early settlement from the Stone Age were found on the characteristic "lion's" rock. At the moment, therefore, it is safe to say that the history of this settlement dates back to the Neolithic period. In the collections of the Archaeological Museum in Heraklion, you can see many artifacts confirming the history of this place also in Minoan times. During the excavations carried out in Lentas, a number of objects from that period were found. It is worth mentioning the findings that were hidden in dome tombs. In their interiors were found animal figurines, jewelry, ceramics decorated with ritual symbols of the bull, as well as numerous bronze arrowheads. Like many other ancient villages in Crete, Lentas was destroyed after the volcano erupted on the island of Santorini. During this period, his fate remains a mystery and even today, after many years of work, archaeologists have failed to shed light on this part of the history of the town. In the following centuries, the importance of the rebuilt Lentas grew with the increasing influence of nearby Gortyna, which later after the fall of Knossos became the most important city of Crete (the capital) at that time. During this period, Lentas was known as Λἐβην (Leben) and was one of the two ports of Gortyna. Its then name derives from the word "white" and is most likely related to the color of the rocks surrounding the former bay around which the town was built. The beginning of the greatest flowering of Lentas falls on the period around the 4th century before the birth of Christ, when the temple of Asklepios is built in the village. Together with the adjacent buildings, it creates a special care for the sick, using, among others, bathing in hot springs. The lack of own coins proves, however, that Lentas has never been granted the status of an independent and autonomous city. In 46 BC, another major earthquake took place in Crete, which resulted in the destruction of a significant part of Lentas. Also Asklepios' temple suffered in this cataclysm. The rebuilt, however, lost the remains of Greek architecture and took the form typical of Roman buildings. Until the fourth century, this temple was an important religious center, and its role began to decline only as a result of the growing popularity of Christianity. In subsequent centuries, the cult of Asclepius lost its importance and the sanctuary was abandoned. As a last resort, the temple, as a place of "pagan worship", fell into disrepair and began to be treated as an easily accessible source of stone. With the fall of the temple, the significance of Lentas also diminished. It is worth noting, however, that there is no evidence that it was ever completely abandoned by the inhabitants. Marked as the port of Leon, it was constantly visible on the sea maps of this region of the Mediterranean Sea. In the mid-nineteenth century, English captain H. Spratt came to Lentas, which was a forerunner of archaeological work carried out in this place. This English vice-admiral, hydrographer and geologist in the mid-nineteenth century during his long journey through Crete conducted research in the field of geology, archeology, physical geography and the natural history of the island. It was thanks to his observations that important discoveries took placenot only in Lentas but also in Tylissos and the famous palace in Malia. At the beginning of the last century, further excavations in Lentas were carried out under the guidance of scientists from the Italian Archaeological School in Athens. Besides, archaeological works are carried out to this day. A wide area subject to special protection and an absolute ban on building houses as well as hotels was marked out around the city. For this reason, the current shape of the town will most likely not change much in the near future. The main beach in Lentas is relatively small and relatively small. On weekends when local residents come to Lentas and it's quite crowded here. If you are looking for a bit of privacy, and do not care about comfort such as deckchairs, we recommend going to the neighboring town of Dityko. You will find there a long and wide pebble-and-pebble beach where you can easily find your own piece of space. The informal atmosphere prevailing on it is revealed by tents broken on the beach as well as by nudists sunbathing among the so-called textile. Another interesting beach located within a slightly longer distance is the Petrakis beach located east of Lentas. It is definitely a more intimate place with a much smaller number of tourists. Thanks to the Artis tavern, serving delicious Greek cuisine, you can spend all day on this beach. It was in this tavern that we ate the best stifado so far. Already at the moment Lentas has quite well developed accommodation base. Even at the peak of the season, you can easily find a room with a typical Greek standard. Of course, it's vain here to look for exquisite large objects with four or five stars, which in addition to accommodation offer AI or spa services. However, we think that the one who chooses Lentas as a place of his leisure is not looking for such attractions. This place is geared towards independent tourists, but also Greeks, which are quite a lot here. Locals also like to come here during their free days. 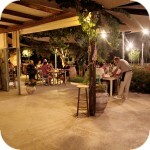 At the beginning we wrote that Lentas is a place where you can find everything that is necessary for relaxation. However, this is not entirely true. The only thing you will not be able to buy in this town, and what can be particularly useful for motorists is fuel for the car. The nearest gas stations are more than 20 kilometers away from Lentas and are located on the other side of the Asterousia mountains. It is worth bearing this in mind if you want to spend some of your vacation here or you just want to go to Crete for sunbathing. There is only one mini-super-market in the village. The specific monopoly causes that the prices offered in it are slightly higher compared to other stores of this type. If you are planning more shopping, we recommend that you make it in one of the towns located in the Messara Valley. A quite good choice may be Moires, where you will find several larger chain stores, as well as a large number of local greengrocers and bakeries. This does not mean, however, that it is not worth visiting the Katerina store in Lentas. We in his modest depths found a good selection of very tasty local cheeses, real Greek yoghurts, as well as local honeys. This store is located by one of the central car parks located in the center of the city. If you plan to drive to it by car, you should drive to Lentas from the direction of Dityko. Lentas is a place that most resembles a hippie Matala with its climate. Certainly not a place that can be recommended to anyone. Too remote from the main tourist routes will not be a good choice as a starting point for those who want to spend their holidays actively exploring the known and lesser known corners of Crete. Each commute to the main road is tantamount to sacrificing a minimum of 40 minutes needed for tearing through the Asterious mountains. Lentas is a good idea for those who want toto escape from villages steeped in industrial tourism. It is also an excellent choice for those who are determined to spend a few days here on a stationary basis interspersed with hiking to the surrounding beaches. A great incentive for the gourmet Greek cuisine can be that in Lentas operates a large number of taverns, whose menu is dominated by local dishes. Strolling through the buildings of the village in the evening, you can sense the delicious aromas again and again, which encourage culinary experiments. Droga do Lentasа. To nie było łatwe, ale to jest naprawdę piękne i spokojne wybrzeże, którе różni się od północy. Lentas jest dobrym miejscem na bazę dłuższego pobytu przy zwiedzaniu zachodniej części Asterousii - na zachód można dotrzeć do ciekawych wąwozów zakończonych plażami - Agiofarango i Martsalo, klasztoru Moni Odigitrias czy odludnej plaży Vathi, na wschód piekna, ustronna plaza u wylotu wąwozu Trachoulas , okolice Kapetaniany z najwyższym szczytem Asterousii Kofinasem - 1200 m ale prawie pionowo z morza, widok w dół na Moni Kouduma ( kolejny klasztor + okoliczne kościoły w jaskiniach wart odwiedzin) przyprawia o zawrót głowy, a sam Kofinas z daleka przypomina Matternhorn - wyrżnie górująca nad okolicą poramida, wejście jest jak na kreteńskie warunki dość dobrze przygotowane - na szycie jest kaplica Timios Stavros ( jak na wielu szczytach Krety na czele z Psiloritasem). Dla wspinaczy - okolice Kapetaniany to jedno z najpopularniejszych miejsc wspinaczkowych na Krecie, jako ciekawostkę dodam też jedyną via ferratę na Krecie. Plaża w samym Lentas jest rzeczywiście niezbyt ciekawa, za to tawerny - jest ich kilkanaście i każda warta odwiedzenia, my po kilku próbach utkwiliśmy w "Porto Lendas" , o ile pamiętam to była trzecia od zachodniego skraju plaży. Niestety Piotrze nie zgodzę się z Twoim porównaniem z Matalą - gdy po 9 dniach spędzonych w okolicy Lentas przyjechaliśmy oddać samochód do Matali zauważyliśmy od razu jak bardzo skomercjalizowała się Matala - tak niewiekiej porcji i byle jak przygotowanej sałatki za o połowę większą cenę nikt by nam nie podał w Lentas, a także nie znalazłbym tam takiej byle jakiejś jakości obsługi. Jeśli ktoś się by wybierał do Lentas to przy wypożyczaniu samochodu należy zwrócić uwagę na prześwit - bez przesady, niekoniecznie Jimny, ale np Panda sprawdzi się dobrze, mu mieliśmy C3 pierwszej generacji, też się nadawał. Piotr dzięki za Twoją opinię. Fajnie, że opisałeś dodatkowe atrakcje, które znajdują się w tym rejonie. Moje odniesienia do Matali były formułowane bardziej przez pryzmat osób osiadłych w Lentas. Daje się tu wyczuć pewien swoisty hippisowski klimat. Szczególnie w rejonie plaży Dytiko. Jeśli jednak już chodzi o sam poziom komercjalizacji to dwie zupełnie rożne miejscowości. I tu w pełni się z Tobą zgadzam. Mnie osobiście Matala bardzo męczy, szczególnie ze względu na ilość osób. Na pobyt lepiej już wybrać sąsiednie Kommos lub Kalamaki. Planujesz już coś na przyszły rok? Ponieważ z różnych powodów darowaliśmy sobie w tym roku wyjazd na narty mamy urlop na dodatkowy krótszy wyjazd. Mamy na razie bilety na kwiecie4ń - lecimy w Wielki Piatek ( 14 ) - po pierwsze chcemy zobaczyć Wielkanoc na Krecie - w 2017 terminy się pokrywają, poza tym chcemy zobaczyć wiosnę - planujemy na pewno Nidę, jak będzie super widoczność to podejdziemy na Psiloritis - może za trzecim razem uda nam się zobaczyć Santorini, co jeszcze - to będziemy wymyślać na miejscu - na ten wyjazd planujemy wynająć samochód więc możliwości jest wiele. Drugi bilet mamy na początek czerwca - planujemy przejechać na południe do Paranimfi i stamtąd ruszyć wzdłuż wybrzeża i Asterousii - najpierw do Tris Ekklises - miejsca gdzie nie dochodzi szosa i gdzie są podobna super plaże i góry - jest to dość zagadkowe miejsce, nie udało mi się nigdzie znaleźć informacji czy są tam jakieś pokoje do wynajęcia, sklep itp - w najgorszym razie zawsze da się spać na plaży. Stamtąd chcemy przejść przez Moni Kuodumę, Agios Joanis, plażę Tripiti do Lentas, ew jak będziemy mieli jeszcze czas to dalej do Kali Limenes i Matali, skąd da się autobusem dotrzeć do Chani. Ale co wyjdzie - się okaże. Na wrzesień wstępnie planujemy Portugalię - ale nie kupiliśmy jeszcze biletów i nie jest wykluczone że się skończy jak w zeszłym roku - znowu Chania.